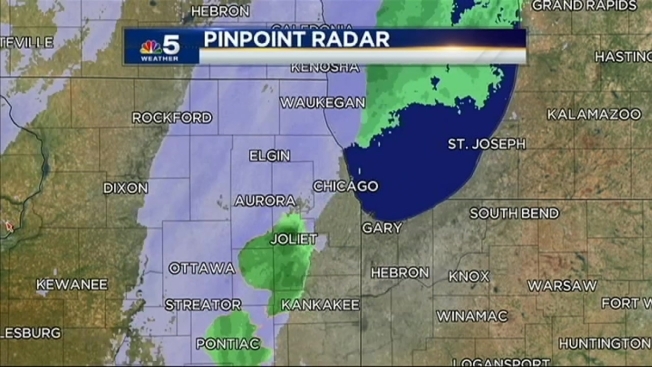 Wednesday brings a fresh white blanket of snow to the Chicago area for the second time this season. While it will not be a major storm system, the timing of the snowfall is not ideal for drivers during the morning rush hour. A mixture of rain and snow will begin to come down in the early hours of the morning before transitioning into all snow in the afternoon and tapering off into light flurries before the evening rush hour. Forecasters predict the snow moving through the area bring an 1 to 2 inches of accumulation. The first band of snow likely will pass across the metro area by 7 a.m., with a second band to follow and continue through the day. Temperatures will fall to the freezing mark or below in many of the inland locations, staying in the 30s across the Chicago metro area for the entire day. On Tuesday the National Weather Service issued a warning advising commuters that a band of “moderate to briefly heavy snow” will form and make its way east across the area before they head out the door in the morning. The snow is expected to cause reduced visibility, according to the NWS. Additionally, accumulations may occur on roads where snow hits the hardest and may impact travel for many in the area. Today: Overcast with a band of light snow mixed with some light rain initially as it crosses the areas from west to east that may be moderate to heavy at times this morning during the rush hour before winding down in NW Indiana by late morning. Continued cloudy with periods of snow showers that will taper to flurries late. Total accumulations, mainly on grassy areas between 1 to 2 inches on average, a few locations will see higher totals. Highs in the mid, possibly upper 30s. Wind: WSW 10 to 15 mph. Tonight: Cloudy with flurries early, some partial clearing late. Upper 20s well inland, most areas in the low to mid 30s. Wind: W/NW 5 to 15 mph. Thursday: Clouds break early for mostly sunny skies; turning pleasantly cool in the afternoon. Highs in the low to mid 40s. Friday: Partly to mostly sunny and pleasantly cool. Highs in the mid to upper 40s. Saturday: Partly to mostly sunny and pleasant. Highs in the upper 40s to low 50s. Sunday: Partly to mostly sunny, continued mild for the season. Highs in the upper 40s to 50 degrees. Monday: Partly sunny, a little cooler, but still well above average. Highs in the mid to upper 40s. Tuesday: Partly sunny, coninued pleasant for the season. Highs in the mid 40s.